State B Wrestling wraps up day one. RAPID CITY, S.D. – At the State B Wrestling Tournament Custer and Philip did well in the afternoon session. Custer’s Logan Graf is moving to the semifinals with a 7-5 decision over Andy Meyer of Canton. At 113, Custer’s Jacob Brunner moves to the semifinals with a 5-0 decision over Canton’s Luke Richardson. At 126, Philip’s Jadyn Coller beat Hayden Pierret of Garrettson to move to the semifinals. Two West River wrestlers meet in the 132 pound semifinals. They are Blair Blassius of Philip and Carson Pinske of Lead-Deadwood. Philip’s McCoy Peterson heads to the semifinals with a 10-0 victory over Seth Peterson of Canton. At 145, Hunter Peterson of Philip won a 4-3 decision over Kody Hagen of Hot Springs to move to the semifinals. At 152, Chance Grill of Custer is semifinal bound with a 3-2 decision over Ty Namanny. At 160, Custer’s Levi Mines beat Bennett County’s Weston Ireland to head to the semifinals. At 195, Garrett Heil of Hot Springs advances to the semifinals at 195 and Lead-Deadwood's Rob Lester is headed to the semifinals in 285 with a win over Zach Richardson of Canton. In some wrestleback action Friday afternoon, Harding County's Jesse McCann won his wrestleback at 138 over Ethan Ortman. 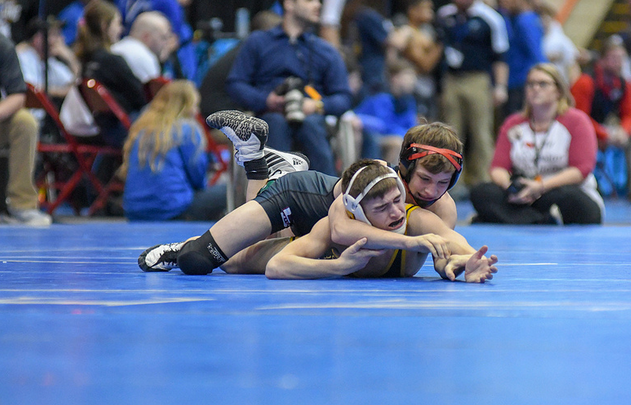 Kody Hagen of Hot Springs won his wrestleback at 145, Tegun Spring of Philip won his wrestleback at 170, Corten Dobesh of St Thomas More won his wrestleback at 182, Grey Gilbert of Harding County won his wrestleback at 220 and Caleb Maciejewski of Hot Springs won his wrestleback at 285.